Hope's Cafe: FitCouture.com Athletic Tee Review!! I discovered Fit Couture several weeks ago while browsing the web for athletic and workout apparel for women. 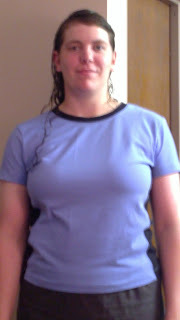 I was impressed by the selection and variety, and was of course thrilled when they agreed to send me a top for review. I chose the Monaco Tee for my review. This tee sports stylish side stripes, and comes in 5 colors. Mine is the Periwinkle color, with black stripes down the sides. It has short sleeves and a crew neck, which is something that I really appreciate. It seems very hard to find athletic clothing that doesn't have a low-cut neckline. The Monaco tee is fitted, but not irritatingly so (it doesn't cling too tightly at all, but isn't bulky or flowing either). Made of a Nylon/Lycra blend, it is THE MOST comfortable workout top I have ever worn! After wearing it to the fitness center once, it quickly became my favorite tee for working out. So comfortable, with a perfect fit, and very girly/feminine-looking! My sister saw my shirt, and decided she wants one too! This is definitely a top you'll love if you give it a try. It makes working out a much more enjoyable experience. Fit Couture has a great selection of fitness clothing; jackets, tops and bottoms! And they offer free standard shipping on all orders! Disclaimer: I was not monetarily compensate din any way for this review. I did receive product for the purpose of review. All thoughts and opinions are mine. Looks like a very comfortable shirt. I agree that it is hard to find ones that are not too low cut and this one looks great. Looks comfortable. I'd definitely try this while working out!